with style and substance: ...bath and beyond. 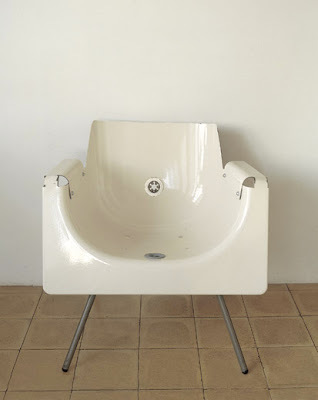 'Bath and Beyond' chair by reddish studios, made of recycled bath tubs and bent steel. I could see this at the head of my outdoor dining table, (insert late summer evening with great wine, good friends and the stone pizza oven I often dream of....) or simply as a garden chair. No need to tip over and drain the water after a spring shower! Wonderful :) A fun element.